A premier membership benefit of the Society for Protective Coatings (SSPC), The Journal of Protective Coatings & Linings (JPCL) focuses on high-performance coatings used for the protection and preservation of steel and concrete in industrial and marine structures. 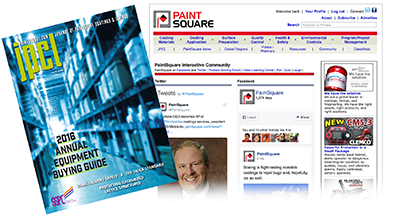 PaintSquare.com houses the JPCL digital edition archive and offers a host of editorial products and services in this sector. Click here for details on advertising and sponsorships. 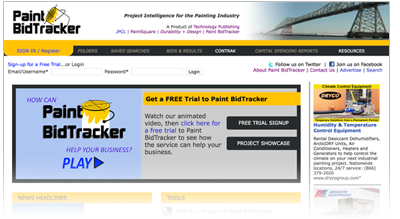 With Paint BidTracker, subscribers are among the first to know where and when industrial and commercial paint projects are happening. TPC offers the only project leads service designed specifically for the coatings industry, with in-depth details on planning and design, bidding, awards and more. Reach viewers with ads on the PaintBidTracker.com home page and in our daily email reports. For more information, call Sales at 1-800-837-8303 x157.